Creek Nation Casino Eufaula is one of nine casinos owned and operated by the Muscogee (Creek) Nation of Oklahoma. 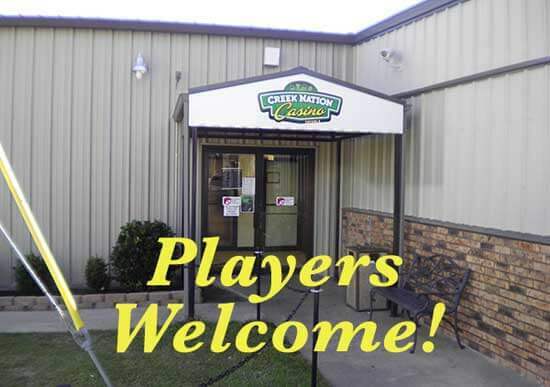 In April 2019 the BIA approved a new casino site on Lake Eufaula where the Creek Nation is considering moving this casino to that location. 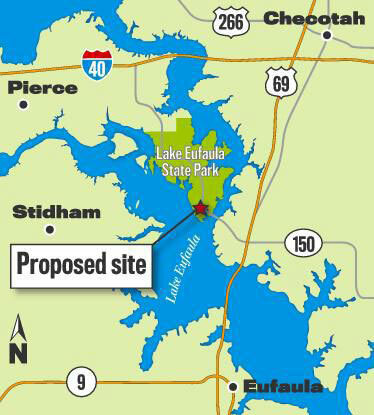 The Dept of Interior has approved an application submitted by the Creek Nation on May 26, 2016 that will transfer 48.58 acres of land on Lake Eufaula into federal trust for the purpose of building a new Creek Nation resort casiino. 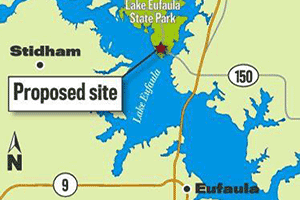 The Lake Eufaula property was once the site of the Fountainhead Resort, which was once a favorable tourist destination. After financial problems the property closed and then sold to the Creek Nation in 2006. The Creek Nation plans to move one of its existing casinos to the new property. Chief James Floyd said the Creek Nation Casino in Eufaula is the most likely one to relocate to the site. Plans for the new casino include a hotel, an entertainment venue, and new restaurants and bars. The federal approval was announced by the Bureau of Indian Affairs on April 10 and will be published in the Federal Register on May 10. The document is post-dated April 30, 2019.